CLICK HERE to learn about our 30 Day Free Trial Membership! CLICK HERE to request detailed BYC Membership information. CLICK HERE to download our PoopDeck Magazine and read all about the great things we do at the BYC! That's what members of the Bradenton Yacht Club (BYC) say about their club. The BYC combines the amenities of a five star resort with the friendliness and warmth of your family’s vacation home. At the BYC, everyone feels welcome, from new Manatee County residents to families who have been part of the BYC for generations. Starting with the first day of your membership, you'll feel like you’re part of the family. Our diverse membership is comprised of boaters and non-boaters, sailors and power boaters, cruisers and racers, career professionals and retirees, families and singles. While many members live in Manatee County year round, many also fly the BYC Burgee in waters from Nova Scotia to Michigan. No matter where they are, they call the club their home away from home. The 52- slip marina provides access to ice, water, electricity, reduced cost fuel, cable TV and Wi-Fi. The heated and cooled swimming pool, Pool Bar and Tiki Bar are beautifully situated along the Governors Cut which connects Terra Ceia Bay to the Manatee River. Both elegant and casual dining is offered six days a week in the spacious formal dining room and the more casual Burgee Room. The club is located just minutes from downtown Bradenton on beautiful Snead Island, home of Emerson Point Preserve. BYC sail and power boaters are regular visitors to our sister facilities in the Florida Council of Yacht Clubs and compete in sail races and fishing tournaments. Non-boating activities include the book club, kayaking, biking, bridge, trivia, tennis, golf, navigators, scuba club, shooting club, investment club and more. New friends are waiting to be met at one of our many varied social functions. For teens, young couples and families, there are plenty of opportunities to make new friends at the BYC. At the end of the day, our members relax in the lounge or one of the dining rooms and enjoy the panoramic view of the sun setting over the Manatee River. Come see for yourself why we are known as one of the friendliest clubs in Florida and share the BYC good life with us! The BYC offers membership that is surprisingly affordable and suitable to your needs. For more information please contact Jenifer at 941-722-5936 or email. Non-Resident Members - Non-Resident Members reside outside the radius of 100 statute miles of the club. Non-Residents have the privileges of Regular Members but do not vote, hold BYC office or enjoy reciprocity with other clubs. Non-Residents don’t pay initiation fees or minimums. 30 Day Promotional – member can use a credit or bank card to pay for charges. No dues or minimums apply. At the end of the promotion, the member may pay initiation fee and join the BYC as a regular member. 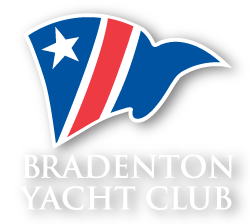 Membership in the Bradenton Yacht is subject to approval by the Board of Directors. We do not discriminate on the basis of race, color or religion.